Woody Guthrie would have been 100 years old this year, and there was a BIG old party for him last night at the Club Nokia in Los Angeles. Because it was Los Angeles, we dealt with the usual trifecta of traffic, long lines and confused box office workers, so we were late to the show, but were in good company as Steve Earle and Tim Robbins straggled in with us too, and seemed just as excited to get in. I learned a lot about Woody Guthrie from my friend, Tom Morello, so was most excited to see him be a part of such an epic show. It was kind of great that one of my very favorite songs was being played by Sarah Lee Guthrie (Woody's granddaughter) and her husband, Johnny Irion, right when I walked in - "California Stars". It's one of those that just puts you in a good mood right away, and set the tone for the entire evening of great music. The very diverse in age (and outfits) crowd clapped along to "Union Maid" and it was clear that everyone in that room had learned from and revered Mr. Woody Guthrie. Joe Henry came out next and said maybe my favorite line of the night, that "Woody's job was to comfort the afflicted and afflict the comfortable." Excellent. He sang a song about Jesus, accompanied by very pretty mandolin, then was joined by Jackson Browne for "New York Town", which cracked people up with its lines, I can get more women than a passenger train can haul and I've get more lovers than the Civil War set free. Player. Dawes came on, and it was noted by them and the audience that it was good to have a young band on the bill, as it shows how very influential Guthrie was and remains to American music. They opened up with a good, railroad-y sounding version of "Hard Travelin'" that was very well received, then Jackson Browne joined them for a similar sounding take on "Goin' Down The Road". For their last song, they played one of their own songs called, "A Little Bit Of Everything", and definitely earned themselves some new fans, as the retired-aged ladies in front of me were very down with it. Legendary L.A. X-Man, John Doe gave us some "Dustbowl Stuff" as he put it, and sang "Vigilante Man"... which was dirty, dusty and rad. Doe was in strong voice, and sounded even better when joined by his "Spiritual adviser and card dealer", Cindy Wasserman for "Do Re Mi". He said, "If we forget a line or go out of tune, I figure Woody would approve." But they didn't, and it was wonderful. We enjoyed a simply gorgeous day here in California yesterday, and all these songs about the Guthrie-era California made it feel all the more special here (but don't tell anyone). "So Long It's Been Good To Know Yuh" was great too. Van Dyke Parks "defined Americana decades before the term was invented" read the evening's program, and when he sat down at the piano, there was respect that you could feel in the room. 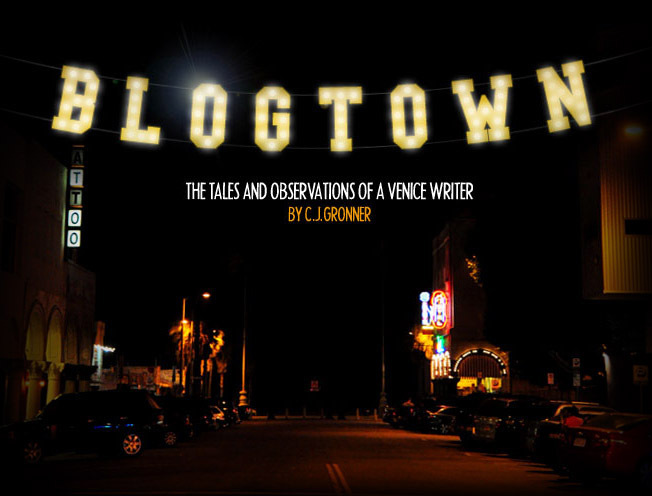 He began by saying, "For all the McCarthy era put the Guthrie family through, this night is their just reward." He was joined by a cellist and drummer for "Pastures of Plenty" and it was equally heavy and lovely. My land I'll defend with my life if it be, Cause my pastures of plenty must always be free. Yes, Sir. Tom Morello (The Nightwatchman) was up next, and I was so happy he was a part of this, as I've long thought him to be the heir apparent to fill Woody Guthrie's work boots. From the sound of it in there, I'm not alone. His work with the Occupy Movement/s and Union battles around the country seemed to have made him better known among this crowd than his other gig with Rage Against The Machine. His trusty "Whatever It Takes" guitar plugged in to play "Tom Joad", very much a story song, much like the songs in the Nightwatchman's own repertoire. Wherever people ain't free, Wherever men are fightin' for their rights, That's where I'm a-gonna be, Ma. That's where I'm a-gonna be." And Tom always is. Tom's band, The Freedom Fighter Orchestra (Carl Restivo, Dave Gibbs, Eric Gardner) joined him for the next one, meaning it was going to Rock. Out. "I'd like to dedicate this to the only Boss worth listening to", Tom said to introduce Springsteen's "Ghost Of Tom Joad". By now I think of as Tom's song too, so inspiring and passionate it is each time he plays it. He has made it his very own with the electric guitar solo that blows everyone away every single time. I've seen it a lot and still get chills. It's HEAVY, and brought the entire Club Nokia to its feet at song's end, and got two raised fists from the Grandma in front of me. Youtube it sometime, it is SICK. Everyone in there is talking about it today, I promise you. Nora Guthrie, Woody's daughter, has a whole bunch of lyrics in the family archives, but they don't all have music. She gave Tom the lyrics and he created the music for the next one, his "first revolutionary love song", called "Ease My Revolutionary Mind". He was joined by his "Choir of Angels", Dawes, Jackson Browne, Van Dyke Parks, and Graham Nash (who FFO member, Carl Restivo shared a mic with and said he was a "vocal harmony paintbrush") for this great song, with lines like I want a union working woman, I want a progressive liberous woman, I want a nice progressive mama, and Tom added, A WOODY GUTHRIE LOVIN' WOMAN, To ease my revolutionary mind. There was another scorcher of a Morello solo, and then it was time for intermission, which we really needed by then. Whiskey was called for. When we returned, Grammy Museum Director, Robert Santelli brought up Woody Guthrie's first wife, Mary, to rousing applause. She was adorable, and it was moving to everyone there to see her so honored. The entire family are American treasures, and so deserving of such an evening of music, celebration and love. That music returned with a set by Joel Rafael, a big Guthrie aficionado, who has also been given lyrics by Nora Guthrie to set to music, and he played his "Your Sandal String", a song about John The Baptist. Graham Nash joined him for another Guthrie collaboration song, "Sierra Blanca Massacre" and they were all feeling it. 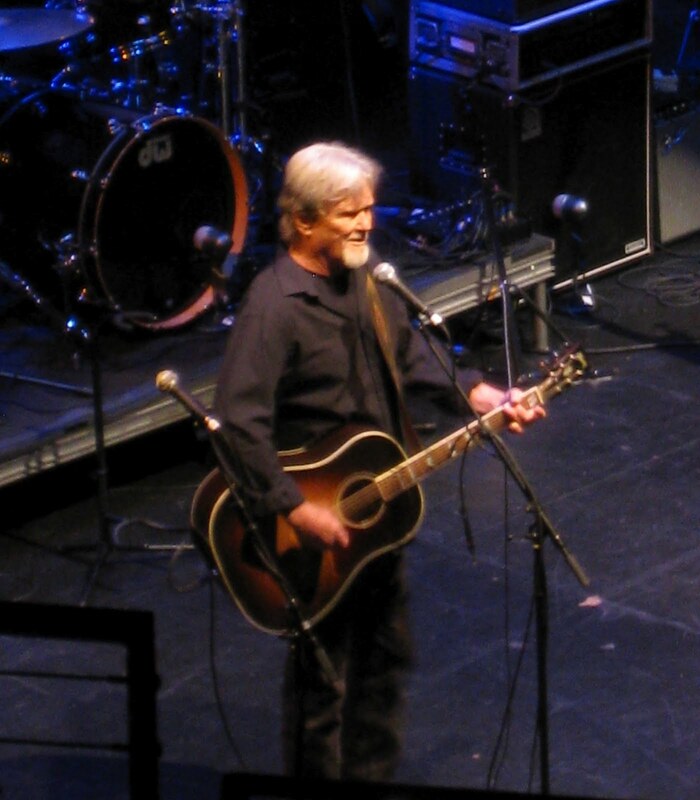 THEN, they introduced the man I've looked up to the most since I was six years old, Mr. Kris Kristofferson! I think I blew out an older gent's eardrum with my whistle, but he said, "It's ok, I love that you love him". That's the spirit! He played "Plane Wreck at Los Gatos", which was perfect, of course, and then his song he said was inspired by Woody Guthrie, "Here Comes That Rainbow Again"... Sigh. 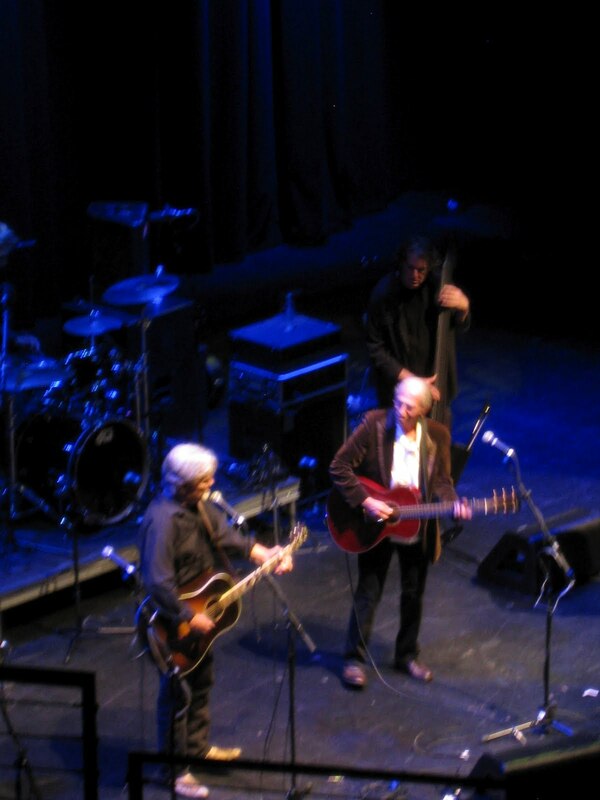 Joe Henry and Graham Nash joined him for "Ramblin' Round" and you just didn't want it to end. Three is not enough from Kristofferson, ever. Nash stayed on and played a new song of his inspired by Bradley Manning, the army private whistle blower that Nash picked up his pen to defend. The place was really listening, really CARING, as he sang, Tell the truth, it will set you free. Amen. Jackson Browne came on with co-writer, Rob Wasserman on bass, and Sarah Lee Guthrie and Johnny Irion as his backup singers, for another Woody lyrics collaboration song, "You Know The Night". It was written as a letter from Guthrie to his wife, Marjorie, and Browne said he had a hard time cutting it down. He must have, because it was one of the longest songs in the world, but all of it was sure pretty. Browne has also been at many of the Occupy events, and wrote a song especially for that movement, called "Which Side Are You On?" It nailed it, lyrically and how they threw it down. Now it was Ramblin' Jack Elliot's turn. As someone who knew Woody, played with Woody, lived with Woody and even babysat his kids, he was the elder statesman of the night, in his red satin shirt and cowboy hat, and a real character (and flirt, I was later to find out). He didn't want any pictures taken, "If I see a red light, I stop, but you can take a picture of me naked on a bucking horse in the back alley after". Haa! He also wanted the teleprompter shut off, which I dug. He gave us "Pretty Boy Floyd" and its line, You won't never see an outlaw drive a family from their home got huge applause and Ramblin' Jack got himself a standing ovation. Sarah Lee and Johnny came back on and told us that Woody died on October 3rd, 1967 at 55. He's remembered as the "Guy who told you what you already knew." They played "Another Man's Done Gone" with its perfectly true verse, Sometimes I think I´m gonna lose my mind, But it don´t look like I ever do, I loved so many people everywhere I went, Some too much, others not enough. Doesn't that just about sum up life exactly? Browne, Rafael, and Nash came back to join Sarah Lee and Johnny on the delightful, "No Church Tonight" which saw Tom Morello and a clearly smitten Nora Guthrie spontaneously slow dancing around the edge of the stage. Special. The whole night actually reminded me a lot of Morello's own Justice Tour shows (which I've been lucky enough to document for him and they remain the best thing I've been a part of), where a whole slew of music stars come together and put on a show for the ages. Each plays a few individual songs, people jam with each other, then they all come together at the end for an all-star jam. Tonight those jams were extra great because they were done by legends in honor of a legend. "This Train Is Bound For Glory" had everyone back out, singing and playing together, and the smiles could not have been bigger on the faces of the artists, or the audience, and everyone danced together, on stage and in their seats. "This Land Is Your Land" is the signature song of Woody Guthrie's, and would be this event's last song. It is appropriate that Morello took the lead on this, as he ends all of his own shows with this classic, always with the censored verses intact, and tonight was no different. As we all sang along, Morello got everyone from octogenarian's to babies, front to back, to jump together as ONE, in celebration of the man that made it his life's work to remind us even today, decades after his death, that this land WAS made for YOU and ME. ALL of us. What a special night! What a special man Woody Guthrie was! What a special country we live in! We have to not only remember that, but fight for it. Not only celebrate it, but DO SOMETHING about it. Every single day that we're given is an opportunity to better it all, and nights like this serve as divine inspiration. Thank you so much to everyone involved in creating such a momentous occasion, and Thank you, Woody Guthrie! You were indeed bound for glory. That's right. 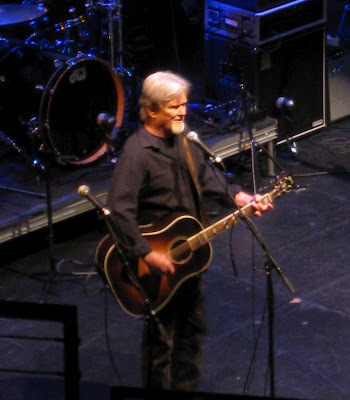 A progressive liberous woman and Kris Kristofferson. Glory. 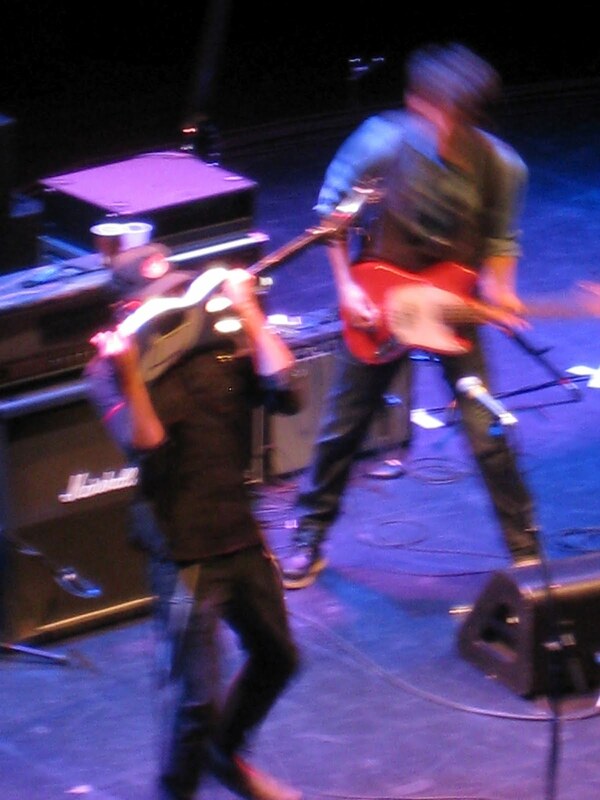 *Sorry for junky photos ... they weren't allowed. Woody would like that too, right?